"If I had said, 'Dustin, just went down to find my ball,' or, 'Rules official, I'm going to identify my ball', loud enough for one of them to hear, it would have been fine. It's the fact that none of them heard it, even though I said it. A spotter said to me, 'There's a ball here. I'm not sure if it's yours'. I said, 'I'm going to identify it'. I put the tee in the ground and didn't even lift my ball, just moved it a quarter roll to see the number. At the time I was thinking more about the golf shot I had coming up than about the ruling. It's one of those lovely Rules of golf." I would take issue with part of Martin Laird’s interpretation of this Rule. In my opinion, it is not sufficient to say “I’m going to identify my ball”, loud enough for a fellow competitor or referee to hear. The Rule requires that they are given the opportunity to witness the lifting and replacement of the ball, which means waiting until they have walked over to where the ball is at rest before touching it. When a player fails to comply with all or any part of the procedure detailed in Rule 12-2, or if they lift their ball in order to identify it without having good reason to do so, they incur a penalty of one stroke. Of course, no penalty is incurred if the touched ball is not the player’s ball. Some readers may be wondering why a player has to follow this procedure when all they want to do is ensure that they do not play a wrong ball. It has to be remembered that a fellow competitor/marker has a responsibility to protect the interests of the rest of the field. The identification requirements mean that they have the opportunity to ensure that when the player lifts their ball, they do not clean it, except to the extent necessary for identification, and they return it to precisely the same spot and lie that they had before touching it. What about cleaning enough to identify the ball? It could have been in mud if the weather had been bad! I don't think that I understand the point that you are trying to make. A player still has to go through the procedure required by Rule 12-2, even if their ball is completely caked in mud. The ball may be cleaned to the extent necessary for identification, but personally I have never experienced a situation where this has been necessary. You will see that yesterday I edited a correction to this mistake. Who penalised Laird? 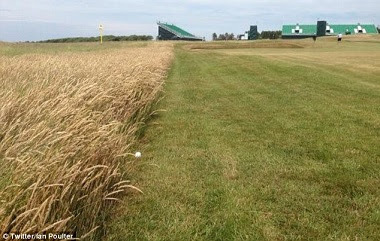 Was it Dustin Johnson or the Rules official? I cannot be absolutely sure, but it was almost certainly not Dustin Johnson, as Laird was not informed of the infringement and penalty until he was approached by the referee on the 16th hole. what if my fellow competitors are very far away from me? Need I walk to them and tell them? It would be more sensible to ask them walk over to you, as the Rule requires that before lifting your ball, you must announce your intention to your fellow-competitor and mark the position of the ball, giving them an opportunity to observe the lifting and replacement.